Nadal bows out before the quarter final stage again. 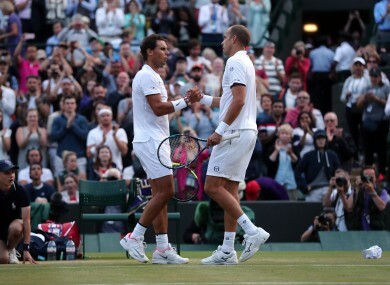 RAFAEL NADAL HAS suffered fresh Wimbledon misery as the two-time champion crashed to a stunning 6-3, 6-4, 3-6, 4-6, 15-13 fourth round defeat against Luxembourg’s Gilles Muller. Just weeks after winning his 10th French Open title, Nadal was condemned to his fifth exit before the quarter-finals in his last five visits to Wimbledon. The 31-year-old Spaniard, finally worn down by Muller after four hours and 48 minutes on Court One, hasn’t won Wimbledon since 2010 and last made the quarter-finals in 2011. Muller, seeded 16th, will make his first Wimbledon quarter-final appearance against former US Open champion Marin Cilic. “Tired,” was 34-year-old Muller’s response after the thrilling encounter, which had the knock-on effect of pushing Novak Djokovic’s last 16 match against Adrian Mannarino back to Tuesday. World number two Nadal converted just two of 16 break points, while Muller fired 30 aces and 95 winners. In a pulsating final set, which stretched to 95 minutes, Nadal saved two match points in 10th game and two more in the 20th. In between, Muller had to fight off a break point in the 13th game and four more in the 19th. Amidst relentless tension, even a mundane women’s scarf played a part when it was used to block out the evening sunlight reflecting off the stands into Nadal’s eyes. Nadal was always chasing the score and he finally cracked in the 18th game of the decider when he went long with a return. “It was a long match. I did really well in the first two sets then Rafa stepped it up and in the end it was just a big battle. I had match points and didn’t make them so it was getting really tough,” said Muller after a second career win over Nadal, 12 years after his first which also came at Wimbledon. “I was kind of feeling that it was going to be over pretty soon. I said just give it a shot, go 100 percent and a great feeling to be winning that match. “I didn’t feel like was playing bad in the third and fourth sets. I just told myself keep it up and if it’s not happening, he’s just too good. “I started serving a bit better and then at the end, it’s just a matter of a few points here and there. It’s tough to say exactly what made the difference. “I haven’t really realised what just happened. It’s a great feeling. I was worried it was going to be over pretty soon. Muller was watched by a VIP fan in the shape of Prince Felix of Luxembourg, second in line to the country’s throne. “I heard he was going to come. We know each other. He’s a big tennis fan. The whole family likes tennis,” said Muller. Email “Nadal stunned by magnificent Muller in five set Wimbledon epic”. Feedback on “Nadal stunned by magnificent Muller in five set Wimbledon epic”.